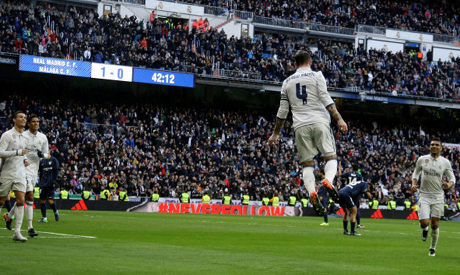 Sergio Ramos made amends for his untimely own goal last week at Sevilla by scoring twice as Real Madrid bounced back from two successive defeats by beating Malaga 2-1 on Saturday to go four points clear at the top of La Liga. The Real Madrid captain headed his side in front in the 35th minute by powering Toni Kroos' outswinging corner beyond Carlos Kameni and struck again in the 43rd by sliding in a free kick from his German team mate from close range to net his third goal in four games. It was the perfect response from the Spain international six days after putting through his own net against Sevilla and inadvertently helping his former side win 2-1 to halt Zinedine Zidane's side's remarkable 40-game unbeaten run. Ramos has now scored six league goals this term, bettering his previous record of five in a season with still half the campaign to go. Malaga had proved difficult opponents and a slip by Raphael Varane allowed Venezuela international Juanpi to pull a goal back in the 63rd minute. It took a good save from Keylor Navas to prevent Chory Castro from levelling moments later. Uruguayan Castro had hit the post for the visiting side and forced another impressive save from Navas in an action-packed first half which also saw Cristiano Ronaldo and Karim Benzema squander clear chances for Real. Ronaldo's frustration grew after the break as he struck the post and was twice denied by Kameni, who almost committed an embarrassing error when he allowed a back pass to trickle through his legs but managed to scramble it away before it crossed the line. Real have a game in hand on their two closest rivals.